"An alarming increase in obesity levels across the world which have risen from 105 million in 1975 to 641 million in 2014, according to a recent Lancet study, create concern about the implications for public health. It is truly alarming that most people nowadays are not aware how they gain weight. Even though your doing some exercise, taking some medication to lose weight, having strick diet and other possible way to lose weight. In fact, in The American Journal of Clinical Nutrition study, nighttime eaters ate 12 percent more calories than those who ate only throughout the day. And in the International Journal of Obesity study, nighttime eaters participated in more binge-eating behaviors than those who didn’t eat after dinner. Binging on high-sugar, high-fat foods causes you to go to bed with elevated blood sugar levels. At any time of day, these set the body up for subsequent sugar crashes and weight gain, with the body quickly storing excess sugar as fat, says Lori Zanini, a California-based registered dietitian and certified diabetes educator with HealthCare Partners medical group. But, since your body uses less sugar as fuel when you’re lying in bed as opposed to running around, potentially more sugar winds up in your fat cells when you eat those foods late at night. Drinking a cup of coffee at night may mess up your sleep in more ways than one: Caffeine not only keeps you awake but also affects your body's internal clock, which tells you when it's time to sleep and wake up, a new study suggests. Scientists also link the consumption of chlorogenic acid, found in coffee, to weight gain. Try to substitute coffee with herbal tea or, even better, with warm water. 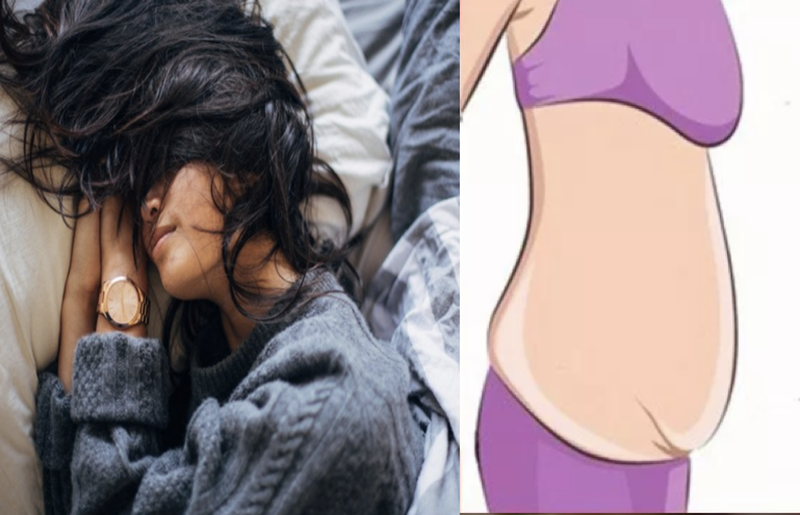 Lacking sleep, you experience multiple changes to your body that can lead to weight gain. Sleep deprivation causes changes to hormones that regulate hunger and appetite. The hormone leptin suppresses appetite and encourages the body to expend energy. Sleep deprivation reduces leptin. The hormone ghrelin, on the other hand, triggers feelings of hunger—and ghrelin goes up when you’re short on sleep. Obviously, exercise is the best way on how you lose weight and have a healthy body. Unfortunately, not everybody can do exercise daily. Lack of exercise and physical activity is another important factor related to gaining weight. Many people have jobs that involve sitting at a desk most of the day. They also rely on their cars rather than walking, or cycling. It is recommended to do at least 2 ½ to 5 hours of moderate-intensity activity (for example, cycling or fast walking) every week. This will help you maintain a healthy weight. "A single three-hour exposure to blue-enriched light in the evening acutely impacted hunger and glucose metabolism," said study coauthor Ivy Cheung in a statement. "These results are important because they suggest that manipulating environmental light exposure for humans may represent a novel approach of influencing food intake patterns and metabolism." The blue light emitted by your mobile phone, tablet, or laptop could be causing you to run to the fridge for yet another snack, especially if you’re using the devices at night. That’s the key finding from a Northwestern University study published in the journal Sleep and presented at the 28th annual meeting of the Associated Professional Sleep Societies. The researchers have found a connection between the glare from our ubiquitous electronic devices and how hungry people feel. Research has shown that a high-protein breakfast can help you eat less throughout the day and gain less body fat. If you're constantly caught off-guard by the morning rush, change both your bedtime and your wake time so you're left with enough wiggle room in the morning for a healthy meal. Also researchers proven that waking up early morning and and exposed your body within 20-30 minutes to natural lighting effects the body mass. In which people who are exposed early morning have lower body mass compare to those light later. Surrounding yourself with the wrong color. Meanwhile, colors like red or orange make you feel energized and hungry. So you might reconsider the color palette of your bedroom from now on. The color blue promotes relaxation and, therefore, better sleep. It’s also the color that suppresses the appetite.